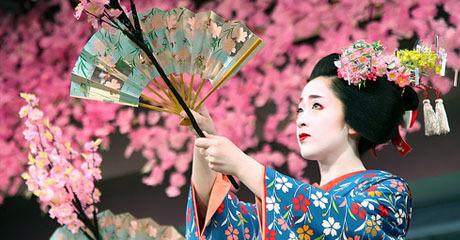 Whether it’s enjoying the fragile pink blossoms of 1,000 cherry trees, listening to the thundering beat of a giant Taiko drum, creating origami masterpieces or honing your sushi-making skills, the Subaru Cherry Blossom Festival of Greater Philadelphia is the place to celebrate all things Japanese. Organizers Officially Kick off the 16th annual Subaru Cherry Blossom Festival of Greater Philadelphia on Monday April 1st at 2p.m. in Rotunda, The Shops at Liberty Place (1625 Chestnut Street, Philadelphia 19103). Mayor Michael Nutter, surrounded by adults and children in traditional Japanese clothing, will stand within a lush environment of blooming cherry blossoms to officially launch the 16th annual Subaru Cherry Blossom Festival of Philadelphia. A family of children will teach the mayor how to speak a few Japanese greetings and will sing him a traditional song about “sakura,” the Japanese word for the ornamental cherry trees which herald the start of spring celebrations in Japan. In addition, the Mayor will conclude the ceremony with the traditional breaking of the sake barrel to officially launch a month of cultural events which include Sakura Sunday, the outdoor festival taking place on April 14 under the canopy of Philadelphia’s historic cherry trees in Fairmount Park. In addition to the Mayor, speakers include Kazumi Teune (pronounced Ka-ZOO’-mee TOO’-knee), Executive Director of the Japan America Society of Greater Philadelphia, and Michael McHale, Director of Corporate Communications, from presenting sponsor Subaru of America Inc. The emcee is Bonnie Grant, board member of the Japan America Society of Greater Philadelphia and Executive Director of Greater Philadelphia Life Sciences Congress. They prepared their Sakura song with the help of Fumiyo Batta, a soprano vocalist and a Japanese language instructor at the Japanese Language School of Philadelphia and at Widener University. Mrs. Batta is also scheduled to sing. The Subaru Cherry Blossom Festival of Greater Philadelphia is a project of the Japan America Society of Greater Philadelphia (JASGP), with tremendous support from Subaru of America, Inc as title sponsor. The project aims to foster a better understanding of the cultural, social, and educational customs of Japan building on the JASGP commitment to plant and maintain cherry trees in local parks. To date, JASGP has planted more than 1,000 cherry trees, supplementing the 1,600 flowering trees presented by the Japanese government as a gesture of friendship in 1926. Upon completion of its 1,000-tree pledge in 2007, the JASGP shifted its focus to plantings in community and neighborhood parks to help green and beautify urban communities. Since 2008, cherry trees have been planted in Clark Park, Franklin Square, and Morris Park.